Inspired by this Brownie Points idea. I wanted mine to be a little easier, though, so no noritake belts or candy molds, or white chocolate for lazy ol' me. I thought about rolling the rolls in crushed almonds, to simulate the sesame seeds on the outside of most california rolls. If I were making more, I would do both. When rice crispy treats are cool, use the top of a small jar as a guide to cut out small circles. Remove them and roll them flat. Melt dark chocolate on a stovetop using a double boiler, and dip the rice crispy treat in the chocolate using tongs. Try not to get any chocolate on the top. When the chocolate is hardened, scrape off a little bit of the top of the treat in the middle, and press a pink jelly bean and a green jelly bean into the depression. 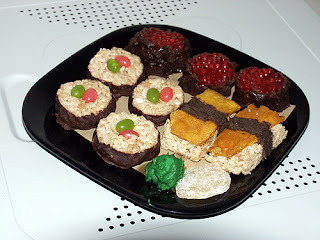 Inspired by one of the comments on the Brownie Points blog, I was challenged to come up with some tasty candy that looked like ikura. Bring water to a boil. Pour a full package of tapioca pearls (I need to check the size on this) into the water, then let sit overnight. Pour out the water. Add 2.5 cups water and bring to a boil again. Add 1 pkg Jell-o and let sit over night. Now you have Jiggler strength Jell-o filled with tapioca balls. The tapioca pearls will continue to expand as the mixture sits. When fully hardened, dip in melted chocolate as above, with tongs. The same as the Brownie Points one, except I used a butter knife to paint a nori belt on this. It looked cool, and was a lot easier than the method described on Brownie Points. Not wanting to get white chocolate, I used buttercream frosting for the wasabi instead. My recipe for buttercream frosting is from the the cupcake blog. Flavor as desired. I added some candied ginger as garnish as well, because I luv candied ginger.